what exactly do you even mean by the install instructions? i cant get mo to excepet an .esp file any advice? Shall we get Fallout 4 support? In response to post #22088719. MistakenMystic wrote: If you are here trying to get MO to work with FNV, STOP!, click on the ' Description' tab and follow the link to Mod Organizer hosted on the Skyrim Nexus. This version is old and not supported. DO NOT USE THIS VERSION! MO works perfectly with all the supported Bethesda games, FalloutNV included. None of the issues mentioned in this thread are still active in the latest version. Lastly full support is offered only from that site and the STEP forum or Bug Genie, both sites are listed in the Skyrim Nexus page. I can get Skyrim Mod Organizer to run FNV 4GB, but I can't get it to actually organize my mods. Help? Firstly, did you not read my post before adding your own? ALL support questions need to be submitted via the official forum, not this one. This is just a placeholder. I will say this though. if this is a genuine question and not some sort of prank, then you really need to examine what it is you are trying to do. Why would you be trying to run a tool designed for Fallout New Vegas on your Skyrim game? Why do you have a mashed up collection of plugins for both games in the one installation? Seriously, go and read the wiki and view the tutorial videos before proceeding any further. Lastly, do not respond here. Post your question in the correct forum. If you are here trying to get MO to work with FNV, STOP!, click on the ' Description' tab and follow the link to Mod Organizer hosted on the Skyrim Nexus. 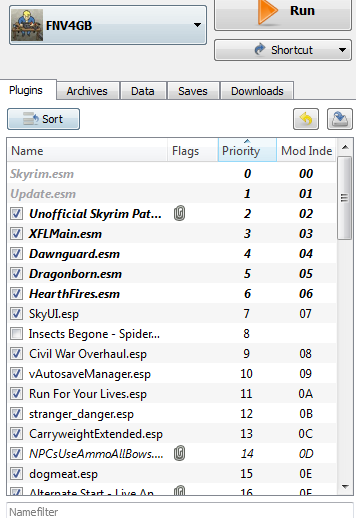 im dealing with a very weird problem AGAIN...im talking now about FNV and FO3 .. i can make it work like a charm BUUUT it continuously refuses to launch the game if certain mods are activated....even if these mod are single esp's and being used for years with ZERO problems and conflicts..
Why should fomm be the only program that installs fomods? Some people cant use it. 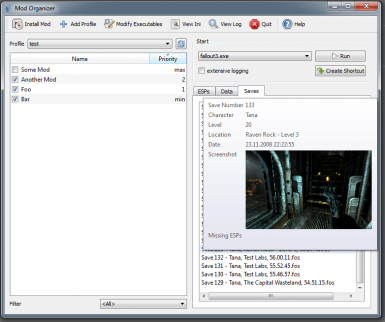 I use fomm for fallout 3. The latest version of fomm crashes my computer every time I run it. Not getting a response on the other site. How to get this to properly run Wrye Bash with Fallout New Vegas? I read about a batch file in this thread, but while that does indeed, launch Wrye from inside MO, Wyre, doesn't actually see any mods installed via MO.